Earlier today, I was glancing through some old comics in a box at a junk store when I happened to see a very interesting ad in the back of a Batman comic. I didn’t read much of the comic but it was about batman fighting the trash man or something like that. Are you a man or are you a wuss? 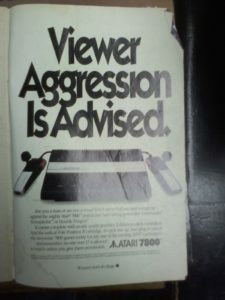 You will never find out until you go up against the Mighty Atari 7800 and hard hitting games like Commando, Xenophobe or Double Dragon. It comes complete with arcade quality graphics, 2 deluxe joystick controllers, And the radical Pole Position II cartridge. So pick one up. And plug in one of the awesome 7800 games today (or any one of the exciting 2600 cartridges). And remember, no one over 17 is allowed to watch unless you give them permission. The last paragraph of the ad was particularly funny as many law makers such as Leland Yee want to stop kids 17 and under from buying these games, which the supreme court ruled was unconstitutional. This ad just happened to fall into my sites mostly because of this ruling. Had the US Supreme Court not bothered to hear the case I might not have taken any real note. But this does show just how long the games industry has been using controversy to sell games and systems for many years. They will probably continue to do so for many more years. Just remember that as Parents, you have the right and responsibility to monitor and control the media intake of your children.